Hollow Egg: Hollow milk chocolate egg. Galaxy milk: Milk chocolate. Galaxy Cookie Crumble: Milk chocolate with cookie pieces (8.0%). 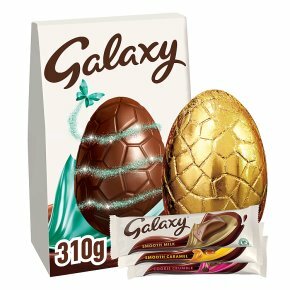 Galaxy Caramel Bar: Milk chocolate with a soft caramel filling (40%).